A 22-year-old Point Loma man accused of killing his parents in cold blood struggled with paranoid schizophrenia, his sister told NBC 7. Lissa and David Haynes were shot dead inside their Tarento Boulevard home early Friday morning. The neighborhood was on lockdown until Peter Haynes was found and arrested on two counts of first-degree murder. Police say he had a semi-automatic handgun in his pocket. San Diego psychotherapist David Peters, MFT, says a small percentage of people with mental illness have schizophrenia. “It's marked by delusions, or misperceptions of reality,” Peters said. “Some of the times those are very minor ones, like perceiving you have special clairvoyant powers." The sister of a man suspected of killing his parents in Point Loma says her brother suffers from paranoid schizophrenia. 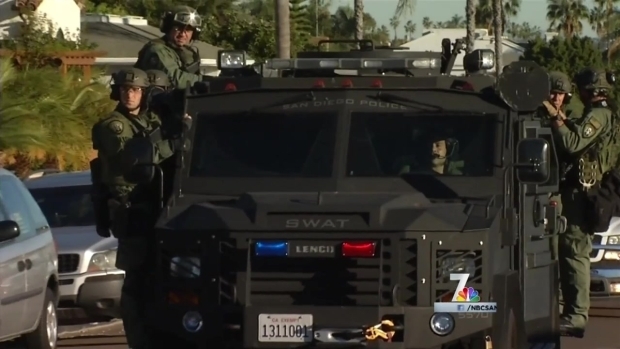 NBC 7's Candice Nguyen reports on Nov. 28, 2014. In other cases, Peters says it can be severe as believing the devil is speaking to you. He says it’s hard to predict any sort of outburst. "This is an illness that looks very different over the population, so the individual characteristics are unique from one to the other," he said. It is important to note Peters is not Haynes’ therapist, nor have officials confirmed schizophrenia played a part in the murders. However, Peters says most people with severe mental illness are more often the victim than the perpetrator. “The vast majority of people with severe mental illness are of no risk to the general population at all,” he said. “The percentage of people with schizophrenia who are convicted of violent crime is very small compared to the percentage of the general population." After situations like this, people often bring up the mental health system, or lack thereof. Peters says proper funding for mental health programs is important. With healthcare privacy laws, the public may never fully know what happened. Haynes is scheduled to be arraigned Wednesday.